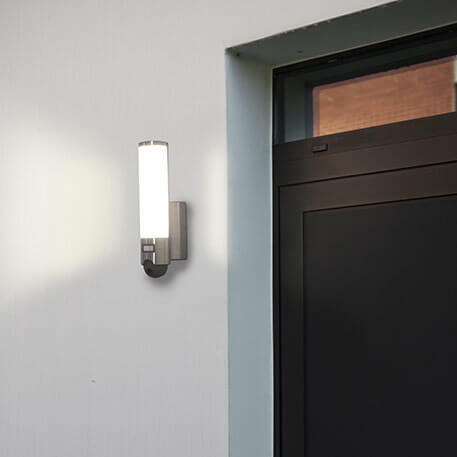 How are outdoor wall lights with motion detectors installed? What are the advantages of a twilight switch? Can you program the light to be permanently switched on? Is it a good idea to get a camera as an additional option? What sort of detection zone is best? What advantages does stainless steel offer? We`d recommend LEDs; they achieve 100 percent brightness immediately. If the sensor covers a large detection zone, you can use shutters to “downsize” it. A built-in camera ensures even more safety and allows you to view your property when you’re on the move. Spoilt for choice? 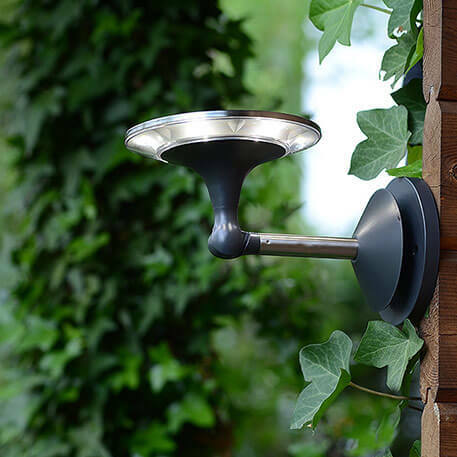 Click here for our Guide to Outdoor Wall Lights with Motion Detectors! More convenient – you will never have to search for a light switch in the dark again. Better security thanks to improved visibility of paths, stairs, and obstacles around the house. Better security as a deterrent – burglars don't like light. At all. Reduces your electricity bill – since the light only comes on when you need it. Protects the environment – because leaving lights on unnecessarily is not the done thing. 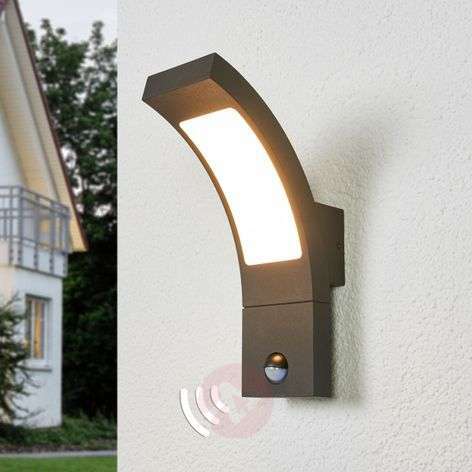 Outdoor wall lights with built-in motion detectors are very practical. Since the motion detector is already integrated into the light, you do not have to do any additional installation. Once the light is attached to the wall of the house, there is only one thing left to do: set the desired detection zone of the motion detector and the duration of the light, and you are good to go. Thanks to the handy instructions, installation is not problem at all. And if you still have any questions, our specialists are more than happy to assist you. Our contact details can be found below. Your light shouldn’t have to compete with the sun. The twilight sensor is there to ensure that the motion detector will only activate the light when there is not enough daylight. It detects how dark it is and only allows the light to switch on when needed. To put it simply: The light only switches on when somebody goes past in the dark. When the sun is out, nothing happens. But, please note: If your light is placed near a street light, for example, this could trick the twilight sensor. Of course, there are always times when you need or want more light around your house. In these situations, it can be annoying if your light turns off by itself. 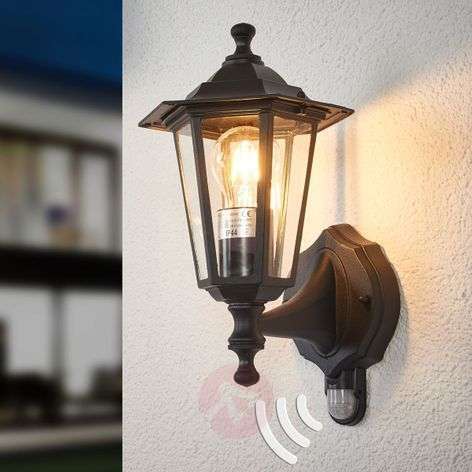 And so, it is convenient to have an outdoor wall light that can switch between motion detection mode and continuous lighting mode. When buying your wall light, be sure to check whether this is possible. This function will be listed in the product description in our online shop. 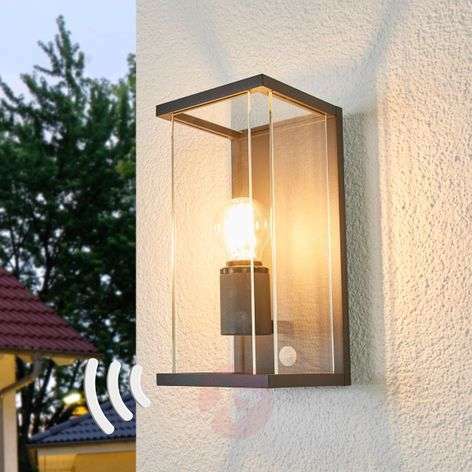 It makes a lot of sense to have an outdoor light that acts as both a camera and a motion detector, particularly in the entrance to your house. The smartphone app allows you to see, in real time, who is at your front door, even when you are not home. A built-in noise-cancelling microphone and intercom system add the finishing touches to this perfect little technical wonder. This allows you to talk to your guests while you are on holiday, perhaps to set a date to meet up when you get back. 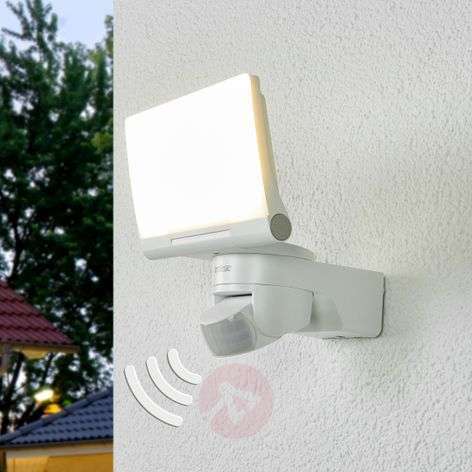 With regard to this question, it is important to know in advance exactly where you want to attach your outdoor wall light and motion sensor. For an entrance area, an angle of 90° is enough. But you can also secure two walls of your home with one single light simply by selecting a detection angle of 240° and attaching it to the corner of the house. For a single house wall, 180° is optimal. Tip: If you are still not sure where you want to position your light, just choose a large detection angle, then simply adjust the angle manually using the shutters. Tip: If you are planning to deter burglars by surprising them with the light from your motion detector, you should make sure that the area directly below it is also covered by the sensor. This can be done using so-called creep zone protection. This prevents intruders from bypassing the detection range. A special lens or a second sensor makes this possible. 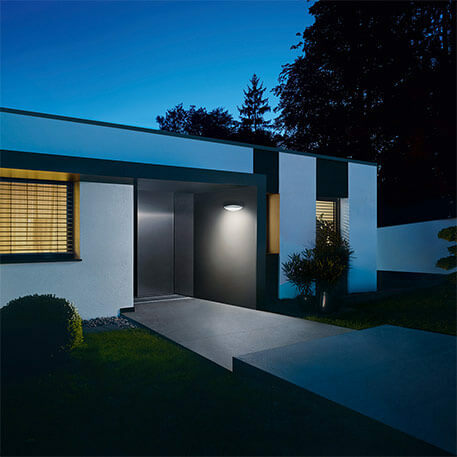 For outdoor wall lights with motion detectors, there is only one answer: LEDs. This is because LEDs light up immediately at 100 percent brightness when someone passes by. Energy-saving bulbs that take a while to warm up are just not the right choice for this kind of device. And once again, energy consumption and environmental factors come into play here: If you are already saving money and protecting the environment using a motion detector, the state-of-the-art LED technology only adds to the positive impact that you are having. Not content with just helping to save electricity? Would you rather avoid it altogether? Then solar-powered lights are just the thing for you. 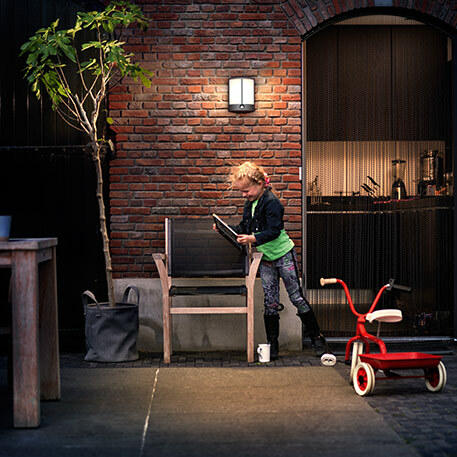 And motion-detector wall lights can certainly be solar-powered, too. Tip: For full functionality, position the light in a sunny spot. If security is of concern to you, it is especially important to ensure that the light does not lose functionality at night due to lack of sunlight during the day. If you want to play it safe, choose a model with a hybrid system like Sun’Connec. These lights use both a power connection and solar technology. Stainless steel is visually appealing. Stainless steel is easy to clean and resistant to corrosion. Stainless steel is extremely hard-wearing and can endure all temperatures. Any more questions for us? We are more than happy to help. Contact one of our specialists for more information about wall lights and motion detectors. Our specialists are available by phone on +353 1 699 2138 or via our contact form.